After three months I finally came around to posting this neat little pencil skirt I made in December (or was it November?) last year. I’m way too much caught up in wedding planning and my new job, so I have to dig up last years projects (thankfully we took pictures already). On my sewing table there’s only the wedding dress at the moment. And it’s probably better if it stays like this. 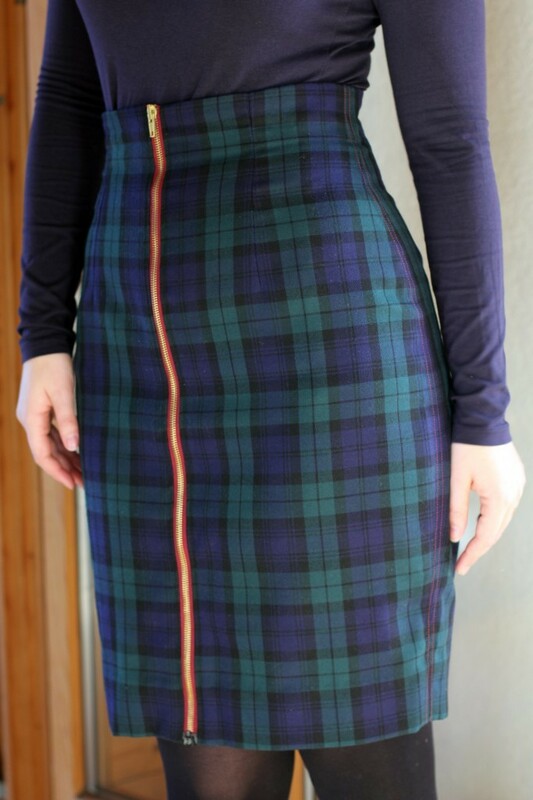 Soo, this is another Sew Over It “Ultimate Pencil Skirt”. If you’ve been following This Blog for a while you know how much I dig this pattern. It might be even my favourite of all time. Over the last year I realised just how versatile it is, from full-on vintage to very modern you can make hundreds of very different looking skirts. I’ve made a mini as well as a faux wrap (yet to be blogged), a wool and also a jersey version. This time I used the fabric included in the Ultimate Pencil Skirt Kit. 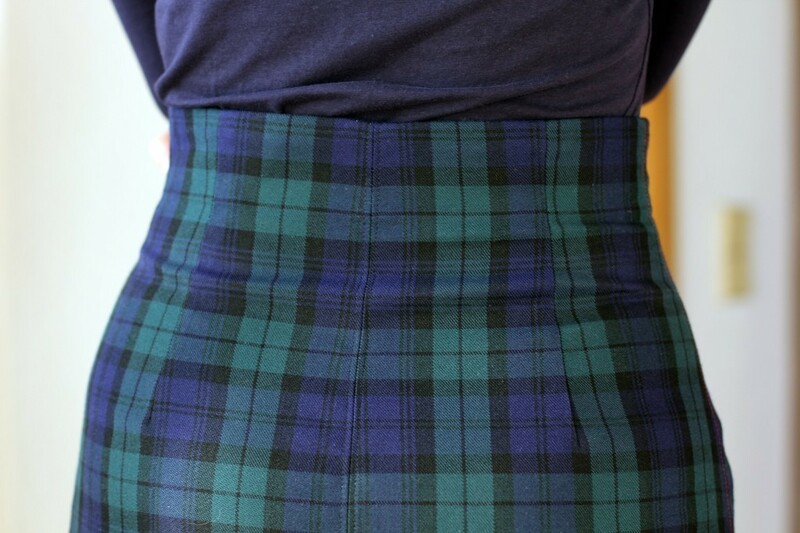 It’s a gorgeous green/navy wool tartan, which I absolutely love. I used a very similar fabric for one of my very first sewing projects, a 50’s dress. Instead of using the matching-colour invisible zip (incl. in the kit) I used a separating exposed zip in a contrast colour. 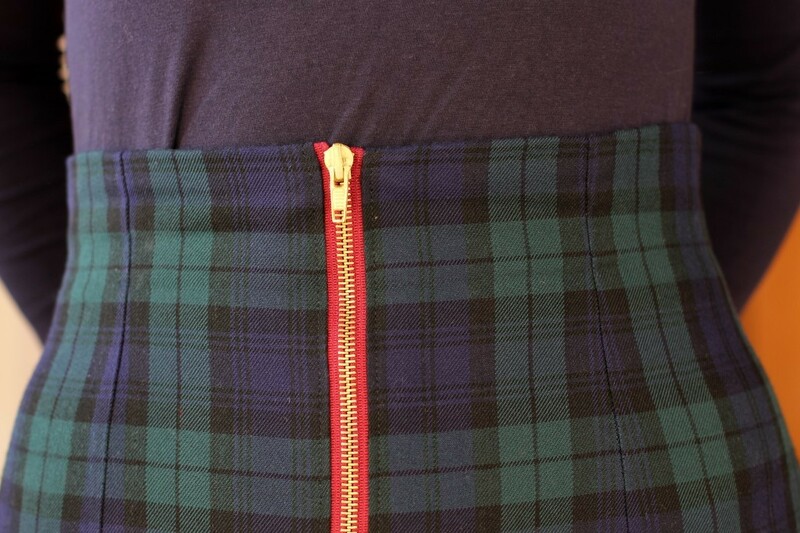 Also, in the original pattern the zip is inserted in the centre back seam whereas I decided to insert it in the centre front. I simply added seam allowance to the centre front, not cutting it on fold. It’s quite an eye-catcher, but I really really like it this way. To match the zip, I used red thread for some topstitching at the side seams. I added two rows of red stitching, and two rows of black topstitching next to it (which is really hard to see in the pictures). It also really helps the side seams to lie nice and flat. I tried my best at pattern matching – cutting the fabric in a single layer really helps. 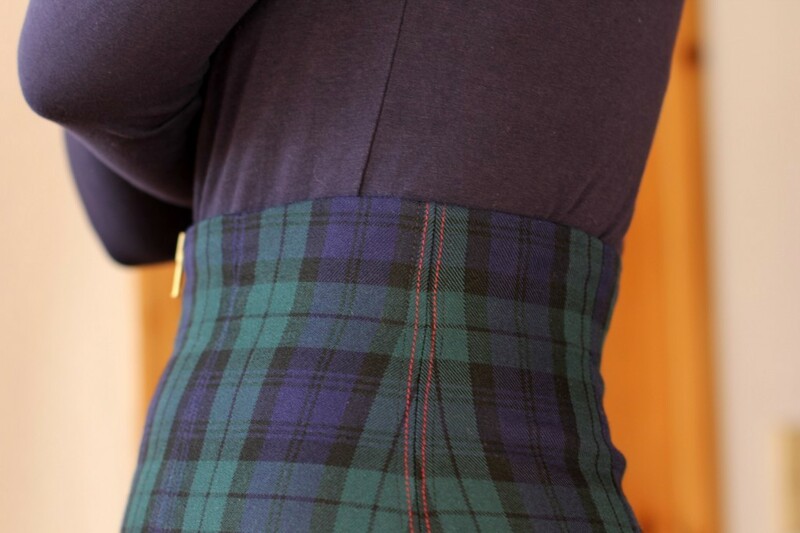 I love how the tartan adds to the silhouette of the skirt. I lined the skirt with royal blue satin. This is really simple – I just sewed it onto the facing, understitched the seam and machine-stitched the hem. I also cut it a lot shorter than the actual skirt, so I didn’t have to worry about the lining peeping out under the kick pleat. I sewed the lining to the zip by hand. It’s so much better than my unlined pencil skirts. I even went back and lined some of them after that. Although the skirt usually stays in place as it is really fitted at the waist, it tends to crease a bit or clings to your tights. Also, I prefer to line wool garments as they’re not as itchy that way. Will I make it again? Oh yes! I love the front zip detail, it gives the retro shape a bit of an edgy look. 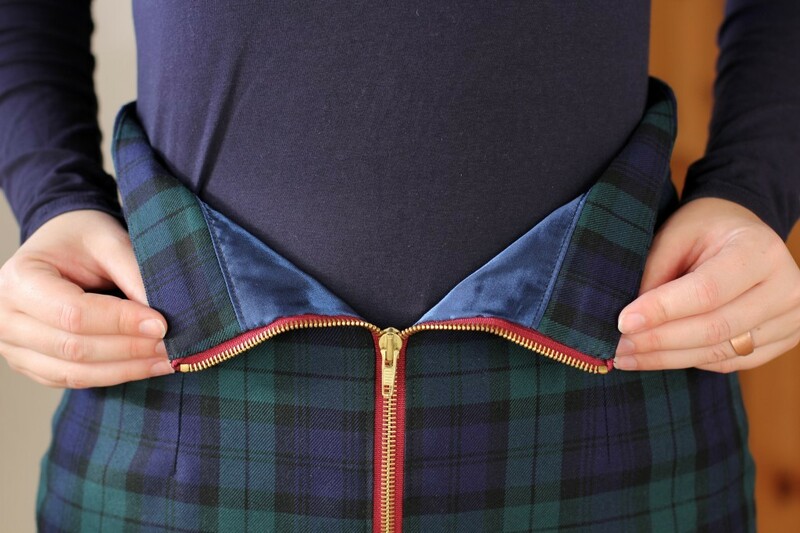 Also it’s too cool to be able to pull the zip all the way down – instant picnic blanket! I love that exposed zip…such a bold design choice. The red top stitching is also fab but I wonder if the black top stitching would be better as red too? This skirt really suits you, no wonder you’ve made so many! I love it – what a triumph! Such a great idea and beautifully finished with the red top-stitching. Bet this gets featured on SOI. I love this skirt! The zip and the top stitching are a brilliant idea! The contrast in colour is really lovely! Thanks so much, Frankie. Love the projects on your blog! The Link costume is awesome! très jolie jupe ,originale avec ce zip devant. wow! That looks amazing. That zip and the red contrasting top stitching accents look fabulous. 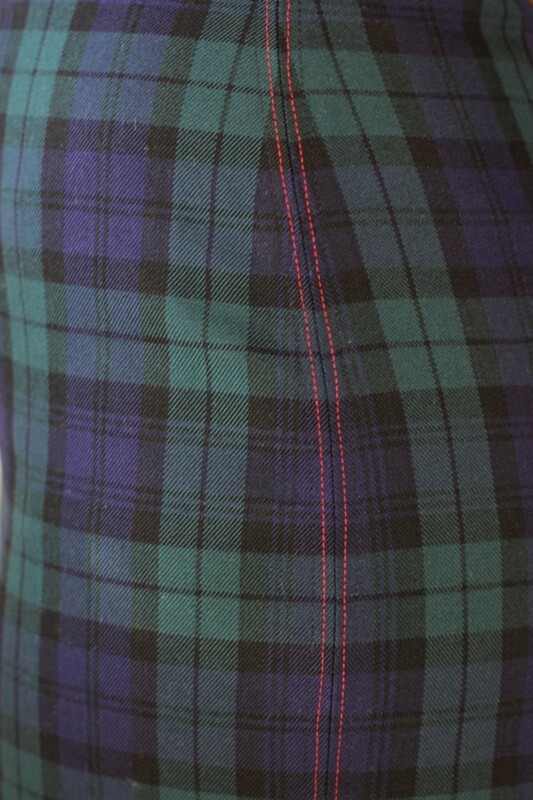 Yeah, I’m really pleased how nicely the tartan looks with that fitted silhouette. Would’ve never thought about that before!